The Trump administration has granted top aide Steve Bannon a waiver that will allow him to control the editorial direction of the white supremacist Breitbart site, while still working for the government on the taxpayers' dime. The Trump White House just disclosed that it granted ethics waivers to 17 appointees, including senior White House staffers. As the Washington Post reports, the waiver gives Bannon "permission to communicate with Breitbart News, the conservative website he used to run." The continued connection between Breitbart and the Trump White House is no surprise, and the murky ties between the right-wing site and Trump donor Rebekah Mercer recently led the U.S. Senate Daily Press Gallery to deny Breitbart's bid to receive a permanent pass to cover Congress. Breitbart has repeatedly and vociferously championed Trump, jumping on his campaign bandwagon early in the 2016 presidential cycle. Breitbart pushed Trump and his message while attacking his Republican rivals, and some at Breitbart believed Trump paid the site to do so. When he was at Breitbart, Bannon bragged that the site was "the platform for the alt-right," the misogynist, white supremacist, anti-immigration movement that is now a dominant force within the conservative movement. Breitbart publishes a torrent of anti-immigrant articles, whipping up fear about them — particularly Muslims — while browbeating politicians who show the slightest signs of tolerance. The site also explicitly promotes racism, hyping articles about cases with white victims of crimes committed by Blacks. 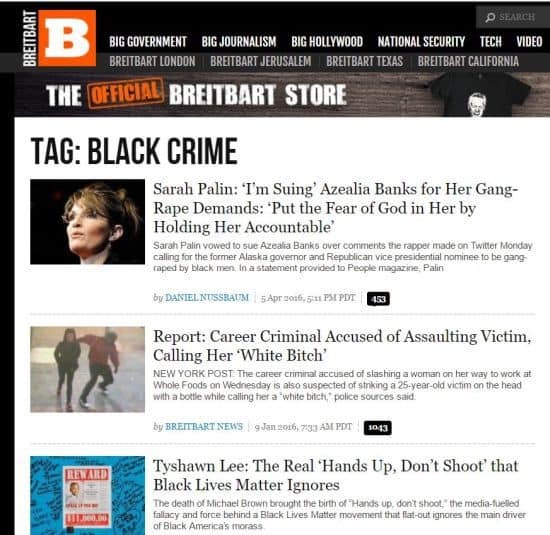 It even has a section of the site tagged as "Black Crime," a one-stop shop for white supremacist content. Breitbart also traffics in misogyny, publishing stories with headlines like "Does Feminism Make Women Ugly?" and "The Solution to Online ‘Harassment’ Is Simple: Women Should Log Off." The site promotes conspiracy theories, and has been caught making up stories out of thin air in order to advance its far-right agenda. Based on the Trump administration's agenda and actions thus far, as well as its current status, embroiled in multiple scandals as it increasingly cuts off press access, it is clear they view the Breitbart connection as vital to promoting themselves. Fox News has taken its traditional position as a Republican administration mouthpiece, contorting itself into knots to justify the Trump team breaking rules and the law, but it is clear that Fox isn't enough, perhaps thanks to its falling ratings and its current scandals. So Trump gave his right-hand man the green light to act as the de facto editor in chief for a hate-based website, and to do so from within the White House. Previous articleGOP lawmaker accuses his constituents of using Medicaid for "financial gain"